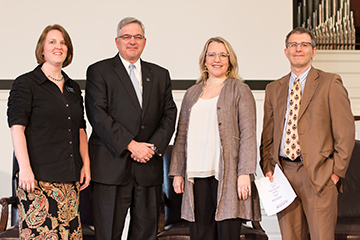 On April 28, Samford University hosted a “Last Lecture” panel for the graduating class of 2016, where four faculty members imparted spiritual, professional and personal wisdom to the graduating seniors. The event was planned by the senior class Student Government Association representatives, and the Office of Alumni Programs and Annual Giving. It was part of the ongoing Senior Giving Campaign. Students were able to nominate their favorite teachers, and four nominees were asked to be part of the event. The panel included Bernie Ankney, journalism and mass communication department chair; Emily Hynds, mathematics and computer science department chair; Howard Finch, Brock School of Business dean; and Julie Steward, associate professor of English. During the hour-long panel, the faculty members discussed a variety of topics, including their personal experiences following their own graduations, advice they would give their younger selves and lessons they learned from Samford students. “If you don’t have your whole life lined up, it’s okay,” said Hynds. The faculty members also offered humorous anecdotes of their immediate postgraduate lives. Ankney recalled how he returned home to Pennsylvania following graduation and got a job delivering pizzas. After an awkward encounter with a high school classmate, he moved from his parents’ house to Washington, D.C. Steward told a story about an eye-opening encounter she had with her favorite author closely after her own graduation, and the wisdom passed onto by this author. The four panelists assured students that postgraduate life is wide open and will take them to unexpected places. Yet, while this is certainly a different and intimidating time in life, it is also one filled with excitement and opportunity. “I hope that this event will provide professional, spiritual and personal guidance as our graduating class transitions into the next phase of our lives,” Terp said. Jimmy Lichtenwalter is a journalism and mass communication major and a news and feature writer in the Division of Marketing and Communication.